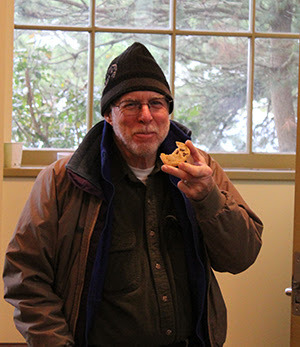 Dennis Cartwright wears many hats: Sound Toxins Volunteer, Sea Star Monitoring Guru, Sensaphone First Responder, Sea Urchin Husbandry Expert, On-Call Aquarist, and Puppy Wrangler to name just a few. He navigates between these varied roles with ease, grace, and a constant smile. Below is a conversation we had yesterday, with a liberal addition of editor’s notes. The puppy is a monster. It learned how to hide things in pots the other day. And it knows that I eat cheerios every morning. I pour my cereal into the bowl over the kitchen floor so every morning, we both get cheerios for breakfast. In what capacity to you volunteer here? Or maybe the better question is in what capacity don’t you volunteer here? Sound Toxins, Sea Star Wasting, HomeCrew, and miscellaneous maintenance stuff. What aspect of the Marine Science Center’s work resonates with you? What was your favorite day of volunteering so far? Hm, I don’t know. That’s a tough one. The day the new crop of AmeriCorps arrived, right? Well, that actually was a great day. You know what the best day was? When you got into graduate school. And then again when Zofia got into graduate school. We’re all so happy for you. Did I ever tell you about seeing Bromus tectorum seeds walk? What is your personal connection to the Salish Sea? Can you tell me about a particular experience of awe you’ve had with the Salish Sea? Yes. I was spending some time at Friday Harbor Labs, taking photos to use in my Intro Biology slides. I was out taking a walk by myself one evening when I heard the strangest noise. I couldn’t figure out what was making it, so I followed the sounds all the way to the beach. Then, suddenly, a pod of orcas surfaced, only 50 feet away from the shore. And this was the first time I had ever seen orcas. It was misty and foggy and they surfaced so close. I’d call it mystical. [and I’d call it MIST-ical. But I’m far too punny for Dennis]. The guy I was rooming with was so mad. [Dennis’ reenactment has been censored to ensure this blog is appropriate for all readers] He’d stayed behind to nap or read a book or something. And I’d seen whales. Why do you feel the Marine Science Center’s work is important to the conservation of the Salish Sea? The more people know about the Puget Sound, the more they will love it. And the more they love it, the more they will want to take care of it. The Marine Exhibit is open for Spring Hours! Come say hello to the resident animals and get ready to meet some brand-new critters! The exhibits are open Friday-Sunday, 12-5 pm. What a great interview! Thank you, Dennis, for everything you bring to PTMSC!